Our story starts with a Venezuelan supermarket and ends with the removal of some price controls. Really though it is about the impact of a ceiling that moves down and up. 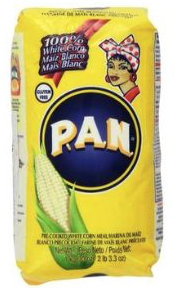 Basic to the Venezuelan diet, Harina PAN’s corn flour would have been unaffordable if its price had responded to an inflation rate moving toward 700%. So the government said that markets had to charge no more than 190 bolívares (maybe 19 cents) a bag. To be sure that sellers follow the rules, regulators have been monitoring the supply chain. When Empresas Polar (a food conglomerate) makes the flour, government is there to be sure they don’t hoard. They are there to detain managers and contain prices. The one goal, though, that government could not achieve was adequate supply. 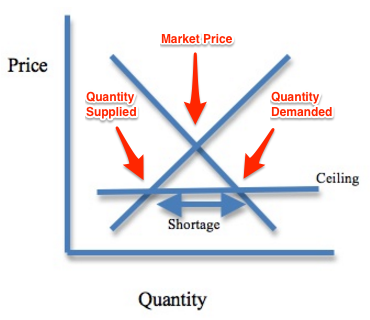 With a price way below the market’s equilibrium, Empresas Polar has no incentive to produce more. A woman interviewed by the Wall Street Journal said it took her three weeks and interminable hours on long lines to get a single bag of corn flour from a supermarket. Others depend on the black market or a government delivery. The problem though is that the black market has high prices and the government runs out long before the end of its delivery list. And the fourth alternative, a bodega’s “combo,” is not much more appealing. Enabling the seller to make some money, the combo is an overpriced bag of goods that includes the cheap flour. Because prices are providing perverse incentives, Venezuela’s supply chain is unimaginably distorted. The NY Times even quoted a robber who refused the offer of his victim’s bank account when he heard it was in bolívares. This week the Wall Street Journal reported that the Venezuelan government was informally allowing some prices to rise. Perfectly describing the impact, one shopper said that with price controls the stores had been full of people but the shelves were empty. Without them, now we have the opposite. In Venezuela, when the ceiling moved down below equilibrium, the result was life threatening food and medicine shortages. My sources and more: The NY Times has more of the Venezuelan robbery story while this WSJ series is also about the Venezuelan people. Ideally, those articles set the scene for thisWSJ description of price control easing. In addition, you might want also to read about the sad plight of Venezuela’s zoos.